In the US, the average age of cars is around 11 years. This highlights the increasing need for car repair. With that in mind, starting an auto repair shop may be a smart decision. However, starting any business requires you to consider several things and understanding and following relevant legal regulations are often the most important. Once you have determined the scope of your operations, you need to decide what services you are going to provide. Will you start with basic services, like tire or oil change or provide more comprehensive services including electrical services, engine maintenance, and collision repair? Whether you want to start with basic services or run a well-equipped auto repair shop in New York, you are required to follow motor vehicle repair shop regulations. According to Vehicle and Traffic Law, anyone who wants to be wholly or partially engaged in an auto repair business or business that deals with diagnosing vehicle malfunctions, must register his/her vehicle repair shop. The Department of Motor Vehicles registers all repair shops that inspect, evaluate, and estimate damage or cost of vehicle repair. To open an auto repair shop in New York, you need to adhere to the following legal regulations. First, you’ll need a corporation that you want to create the auto repair shop under. This includes the formation of an LLC or other corporation, certificate of authority, and worker’s compensation. To form an LLC in New York, our friends at LegalZoom wrote a good article here. The second step is to file an application with the register or commissioner. The application will include information on your repair shop’s sales tax number, and written permission from the municipality where your shop is located that shows compliance with building regulation, zoning, and planning commissions. In addition to that, you will have to provide form VS-1 with municipality letter, indicating no other repair shop has the same building regulation codes. Along with an application, you will have to submit $10 (non-refundable fee) along with $150 registration fee, which remains valid for two years. There is no doubt that getting into the auto repair business has great scope in the future if you know what legal regulations you are obligated to follow. The aforementioned points will help you make a well-informed decision and guide you about the right procedure to open an auto repair shop in New York. 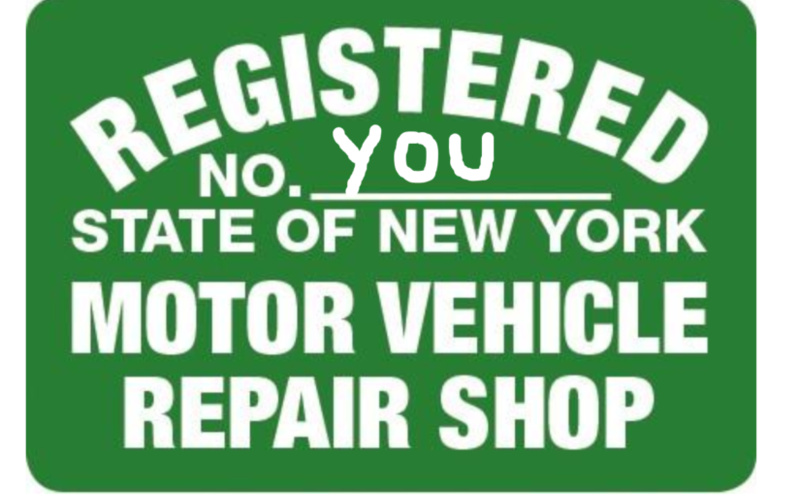 Need help or additional clarification on opening an auto repair shop in New York? Click here to request help with locating or filling out forms.